Liz's Paper Loft: MCT Scrapping The Little Things ~ happy anniversary! MCT Scrapping The Little Things ~ happy anniversary! Hello! Today is Scrapping The Little Things over at My Creative Time. Truth be told I've kind of let my scrapbooking get a bit behind, even using the pocket style albums. :/ So I've been trying to keep at least this year up to date. Oh...the problems of a scrapbooker! LOL! 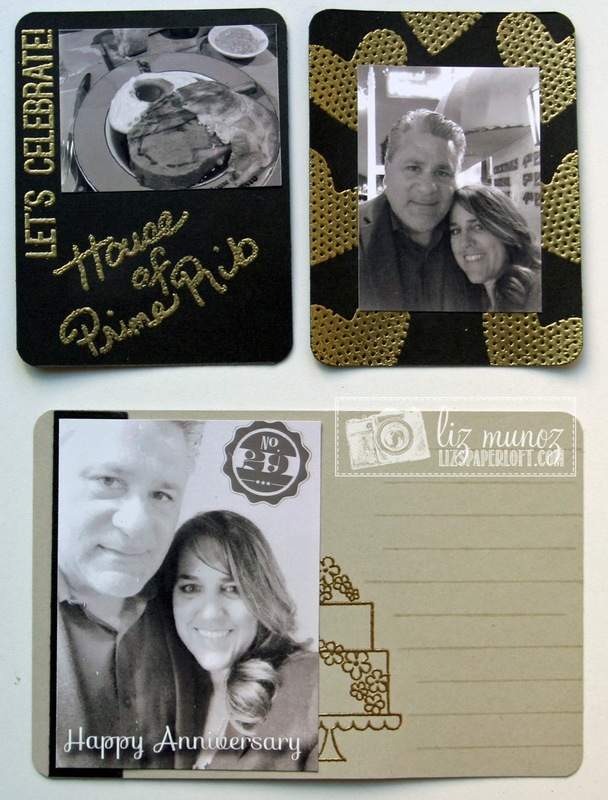 My pages are from my anniversary dinner, my husband has been wanting to take me to the House of Prime Rib in San Francisco for quite sometime. He tried to get a reservation on a Friday night six weeks in advance, but it was already booked so Thursday night it was. Yes, six weeks for a reservation! If you're ever in the city and like prime rib, it's a must! It's been there since the 40's! Choosing the sepia tone of the pictures gave me the idea to go monochromatic for the whole layout. I must let you know it does look better in person. In the pictures it appears very dull. Oh what a super cute pic of you & your sweetie. Loved your story share and have to say thanks for the sepia pics as I would've been grossed out LOL so kind of you!! I too love the way you scrap and did LOL at your comment of "The problems of a scrapper" I love your total monochromatic idea....it definitely is a fabulous look!! YOU so ROCK!! I think it's gorgeous! Love the cake peeking behind the picture! 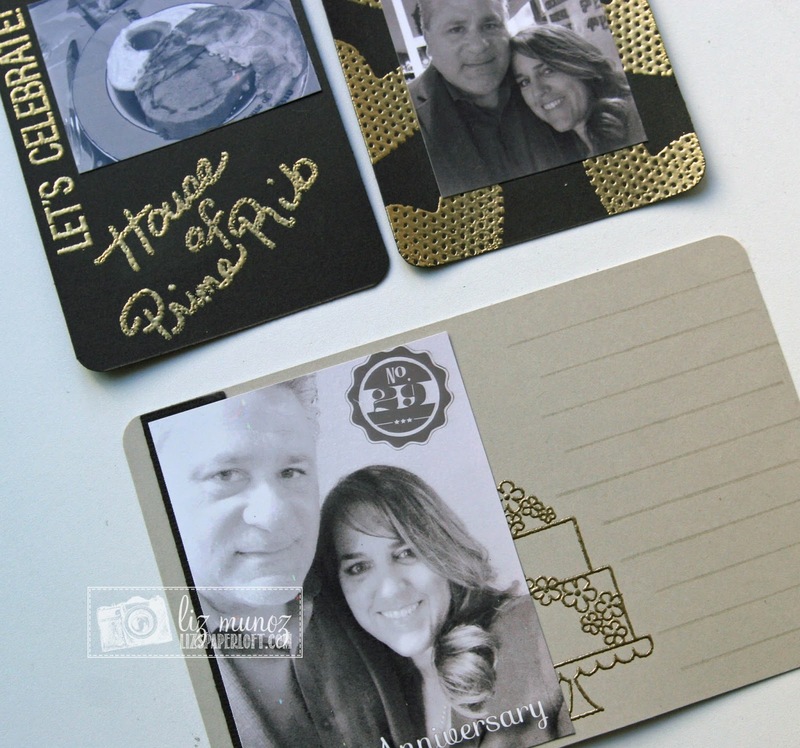 I like the monochromatic theme with the gold embossing! The cake peeking out is a cute idea. Beautiful job. Six weeks??? I don't think I have ever heard of a restaurant making reservations that far out. It must be worth the wait! So beautiful Liz! I love the black and gold color combo! 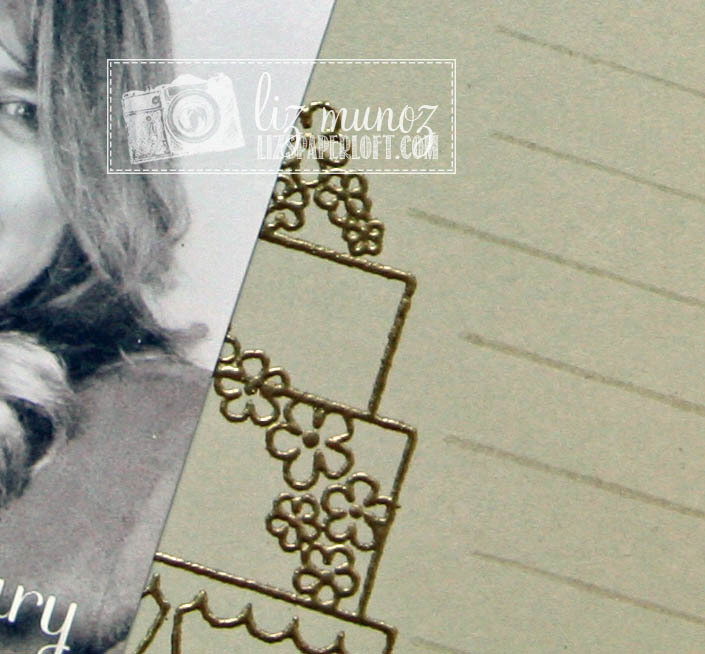 Awe Liz ~ your cards turned out PERFECT and BEAUTIFUL! 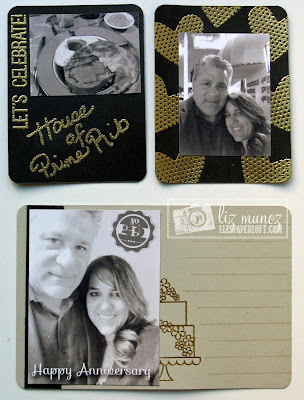 LOVE how you did them in gold ~ they look amazing with the black and gold theme! BEAUTIFULLY done!! CONGRATS too!